The tulip, daffodil and azalea blooms may have already shriveled up and blown away here in the south, but this week, I had the privilege to witness good old, firmly rooted Southern trees bloom and blossom right before my very eyes. It all started with a simple email. Within minutes an email came that would prove to be a game changer. I have the privilege of being a small part of my church’s newest campus plant near my home. And I have also had the privilege of getting to know the Director of Women’s Ministry. It was she that sent this game changing email. I emailed my friend and he emailed this young woman. She was completely humbled by the gesture. Step one complete. Over the next couple of weeks, I kept getting a barrage of questions thrown at me. “Umm, not sure, let me get back to you,” I would say. How in the world did this go from, “Hey, does anyone have any spare things?” to “Hey, we are going to throw you an awesome housewarming shower….and by the way, you aren’t going to know a single person there.” We settled on a date for the shower and I offered up my home for the event. Step two complete. My mentality was that this girl would be content with anything she gets. I could sense that from her humble responses that she gave me. However, my peers started throwing questions at me like “Do you know what her color scheme is?” and “Do you know if she needs dishes?” to “What if she gets too many towels?” To most of us, these seem like legitimate questions, right. Certainly it would be awful to give someone purple towels if their favorite color is blue. Or would it? Probably not. The night of the event arrived. I still hadn’t met Victoria, the recipient of our housewarming gifts. I had no idea what she looked like or what her personality was going to be like. I could gain a sense from our email contact and phone conversations, but other than that, I had no idea. We also had no accurate idea on how many women would be showing up or how many gifts would be showing either for that matter. We prayed for a great turnout and lots of support. I attempted to decorate (not my gift), arranged the chairs, turned the music on, and a food angel brought wonderful food for us to enjoy. And then, gifts started arriving. 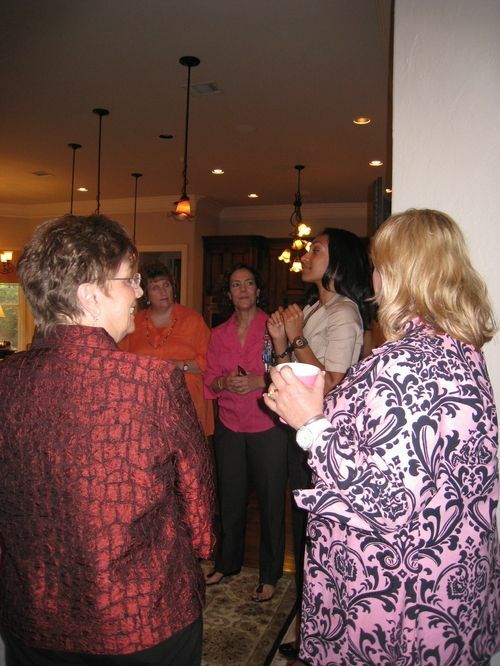 There were gifts sent by women who couldn’t attend the event and gifts arriving as the guests arrived. The tabletop where the gifts were to be displayed was overflowing and only a few guests had arrived by this point. We had to start piling the gifts on the floor next to the table. The packaging was so pretty and festive and many had been completely creative with their gifts (you could tell some of them had done this kind of thing before). The women, some of whom didn’t know each other, introduced themselves to one another, chatted and looked over the presents. The house began to fill up with women and then, Victoria arrived. She walked in completely in shock. She was overwhelmed within a few feet of the front door and she hadn’t even gotten to the back of the house where all the presents were yet. She tried to hold back the tears, but they began to flow and she began hugging everyone. She was cute as a button. The women, each and every one of them, greeted her with a hug and a smile. This young woman was literally wrapped in love by every woman there. Even some of them started crying. We opened in prayer and then let Victoria get her food first. We all ate and chatted some more. Finally, it was time for Victoria to share her testimony. The women in the room were curious about who she was. And Victoria obliged us all by sharing her testimony. Looking at Victoria, you would have no idea of the scars she holds from her past. Looking at Victoria, you would have no idea of the darkness she endured for so many years. Looking at Victoria, you would have no idea that she had just turned 24…she seemed much more mature and well spoken than that. But in looking at Victoria, one knew that the Lord had gotten a hold of her and His light beamed from her. On this night, the light was shining both ways. Our light was shining into Victoria to let her know that there are sisters in Christ out there who care about her and her light was shining into us to remind us that we were all called out of darkness at one point. Victoria then moved on to open her multitude of presents. There was everything you could think of to set up a new home, along with a few gifts for her three-year old son. You could tell that these gifts were purchased with care and donated with love. 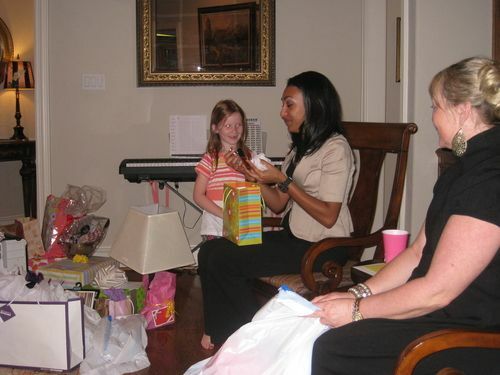 The one thing that stood out to some of us was the manner in which Victoria opened her gifts. Most of you reading this blog have had a party at some point in your life. 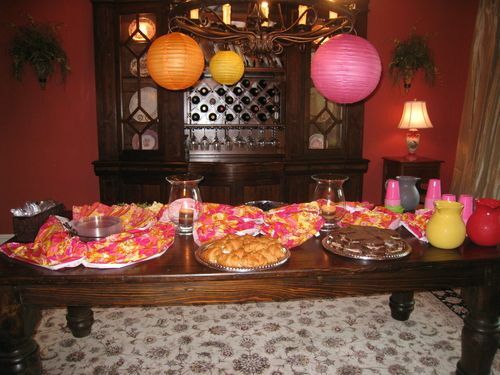 Some have had wedding showers thrown for you, housewarming showers, baby showers and birthday parties. We all know the routine. If the gifts are actually opened up during the party, you glance at the card, set it aside, open the gift, “oooh and ahhhh” and move on to the next one. But Victoria, she read each card, out loud, and tried to put the name to a face. She slowly opened each gift and examined it with care. It took a while, but she made it through all of them. She relished in the moment and savored it. 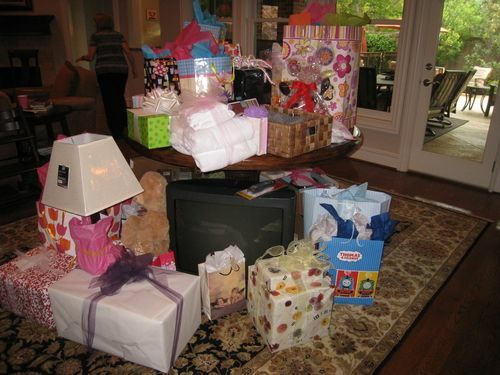 Midway through the gift opening, Victoria commented about the fact that she had never had a birthday party before. This was her first party ever and here she was, sitting in a room full of strangers who now called her sister and friend. Victoria had explained during her testimony how she had been the caregiver most of her life. Her parents were separated and remarried and they had more children with their respective others. At 14, she was raising her young infant siblings, going to school, working a job, and paying the bills. No one was taking care of her – she was taking care of everybody else. Well, that night at the shower, it was time for others to finally take care of her. Ultimately, she knows that God takes care of her every need now, but that shower reflected how sometimes God uses others to show His care and love. Once all the gifts were opened, the party wrapped up. We then began the task of trying to fit everything into her small SUV. We got most of it in, but not all of it. We then realized that six of us helped her load it, but at home, she would be alone unloading it. Was it even possible for her to get some of the things in by herself? Not a chance, especially since some of the items didn’t fit into her car. Two of the women at the party offered to follow her with the items that didn’t fit and help her carry everything in. By this time, it was gaining on 9:00 pm and these women were agreeing to go into an area of town they knew little to nothing about. Truly servants. As I cleaned up the house that night, my throat tightened and I remember feeling so much peace and joy in my home. I could feel the enormous amount of love that had been in that place over the last couple of hours. Jesus had been in attendance at that party. He came in the many different shapes, sizes, and ages of the women who selflessly gave of their time to be a part of the shower and a part of this young woman’s life. Victoria’s life is forever changed and so is mine.